We live in a “law-thick” world. For individuals and organizations in both the public and private sectors, navigating the large number of complex laws, rules, institutions, and procedures that pervade American life is virtually impossible without some assistance. Some argue that "there are too many lawyers." Others argue that the unmet need for legal services is so high that it constitutes a human rights crisis. This book exposes why it is easy to access legal services for some, while it is virtually impossible for others, and why some lawyers have successful careers, but others cannot. 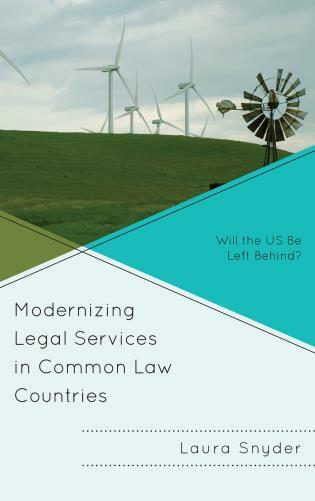 This book argues that the problems plaguing legal services in the US can be only be addressed by a radical overhaul of the rules that govern how legal services may be delivered, as well as radical changes to who exercises the power to make those rules. 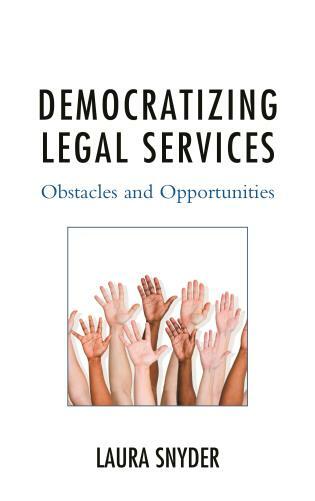 Through interviews with those with experience with alternative legal service providers, this book exposes the formidable obstacles that exist along the path to those changes, as well as the opportunities that await. Laura Snyder has been a lawyer, both in law firms and as in-house counsel, for over twenty years. She received her JD from the University of Illinois, a DEA from the University of Paris I, and a TRIUM Executive MBA. In 2007 a quiet but cataclysmic event occurred in the legal world: the enactment of the UK Legal Services Act. It enabled non-lawyers to own and run legal practices. The shocks have since been felt around the world. Using forensic analysis, Snyder dissects how the legal profession has tried, and failed, to protect its monopoly as its world turned upside down. And in telling the stories of those involved, she powerfully brings it all alive. The global acceptance of MDPs and ABS is undeniable. Laura Snyder has added her voice to those who call on the organized American legal profession to look forward and not backward regarding the business associations permitted to lawyers. She correctly concludes that unless the American legal profession acts soon, it will be alone in the world, inhibiting the capacity of American lawyers to compete in rapidly expanding global markets. Failing to act, the American legal profession will once again see change flood over the walls it erects in its misguided efforts to remain the same. This is an optimistic book. It sets out clearly and persuasively the case for opening up the legal market and why it should be seen as exciting, not threatening, for lawyers and clients alike. Alternative structures are not a panacea and are only a means to an end. But, by giving lawyers and others more means to deliver legal services, we should move closer to the end of democratizing the law.